I bet you never thought this day would come. Our BCS Championship review show is here! Join the College Football Guys as we discuss the outcome of the BCS Championship game. Who should be the number one team in the country? Is it time for the Mountain West to become a BCS Conference? Finally, Pete Carroll gives us some meaningful words of inspiration. Sounds like a Final Score to me. All the news in college football last week was focused on one quarterback and one coach. At a press conference in Los Angeles, Pete Carroll looked like the coach of the University of Spoiled Children after his stud quarterback Mark Sanchez announced his departure to the NFL. Sanchez's decision was the last of several highly publicized announcements of quarterbacks staying and leaving college football. The publicity and fanfare of these decisions drown out a decision that was made in Baton Rouge, LA Thursday. Andrew Hatch, the man that entered this year as LSU's starting quarterback chose to transfer back to Harvard and finish his degree in Cambridge. Why is this news of any significance? Lets start with a couple questions for you. Have you ever had a dream that you never achieved, or better yet, you never even tried? Is there something that you want to accomplish today but fear of failure is keeping you from acting? Andrew Hatch had a dream and now he leaves Baton Rouge behind with no regrets, no "what-if's," or "could I have's?" He accomplished his dream. To play quarterback at a Division I-A program. He now leaves to accomplish another goal. To earn a degree from Harvard. Sure Hatch may have underestimated the impact of the hits he would receive in the SEC. He may not have led the Tigers to an SEC Championship, or even complete an entire season. He wasn't on the podium with Bradford, Tebow and McCoy. He didn't have a press conference to declare himself eligible for the NFL draft. But he was still a success. He started at quarterback for a SEC program! The defending National Champions none the less! Do you sleep well at night knowing you have at least tried to accomplish your goals and dreams? Andrew Hatch has no problem sleeping tonight. He achieved the improbable. Yesterday, an African American officially become President of the United States. 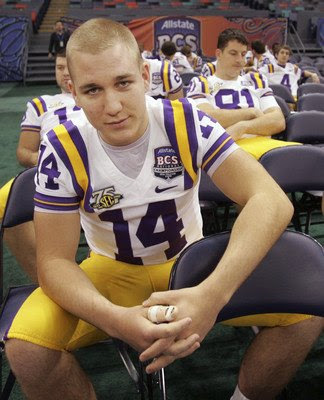 A few months ago, a skinny, Morman, Harvard quarterback -from Utah!, started for the LSU Tigers! What steps will you take today to sleep better tonight? We know! We know! It has been FOREVER since we have posted on the blog. Our apologies. We have been in the middle of Christmas, job search, travel and sickness. We are BACK! 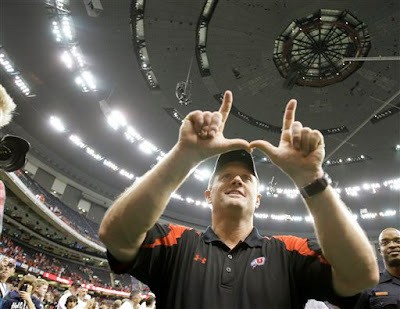 You might think that we are slow with this post, however you might reconsider once you find out that Salt Lake City had their parade for the undefeated Utes today, 15 days after they toppled "mighty" Alabama! You might think we are still under the weather with the unveiling of our final Top 25, but so be it! Let the debate continue! Others receiving votes: Georgia Tech 4, Nebraska 3, Kansas 1. Big 12 South: Best Division in College Football - Oops! It seemed to true to be a lie. How could high scoring offenses and great quarterback duels be wrong? The Big 12 South HAD to be the best division in college football! Most of us thought the Big 12 North should be abandoned and Texas and OU should rematch for the Big 12 title. You might be reading this and saying out loud, "But Texas won last night!" You would be correct. The score in the paper this morning and on the University of Phoenix Stadium scoreboard clearly show UT the winner, however the game didn't. It took an early missed field goal and a last second touchdown for Texas to defeat an Ohio State team that has been destroyed in every big game it has played since the last time the Buckeyes played in Glendale. Still claiming to be the best team in the land it is obvious that Longhorn players, coaches, and fans didn't get a chance to check out the other bowl games this year or even their own game. Texas' "#2 Rush Defense" allowed the Buckeyes to scamper for 203 yards. The rest of the amazing Big 12 South has fared even worse this bowl season. Texas Tech and Oklahoma State ran into buzz saws from the number three team in the SEC and the second best team in the Pac Ten! So just how good was the Big 12 South this year? Who really knows? The top four teams in the division have defeated exactly TWO top twenty-five schools and both of those schools happen to be on OU's schedule, Cincinnati and TCU. A selection of the other powerhouse schools these "vaunted Big 12 programs" have defeated - Washington State, Washington, UTEP, UMASS, SMU, FAU, Eastern Washington, Chattanooga, and Houston. Don't feel too bad. We have been fooled in college football before. In fact it wasn't that long ago. Think back with me if you will. The place Ohio Stadium, Columbus, OH. Is it all starting to come back to you? Remember on that day when we thought Ohio State and Michigan were the #1 and #2 teams in the country? When we still thought the Big Ten was a great conference? Heck, Wisconsin was a top eight team! People were yelling for a Michigan/Ohio State BCS Championship rematch. You remember now don't you? Do you remember what happened after that day? Of course you do! Wolverine and Buckeye fans paid me too much to repeat what happened in the weeks, months, and years that followed that fateful evening. However some of the mess had something to do with Urban Myer's Florida Gators. Is the Big 12 South the best "conference" in college football? Doesn't look like it. Maybe in the future we shouldn't be so quick to pass judgement and someone should warn the Sooners!